Bucky Doo or Buckydoo - What's in a name? Ask anybody in Bridport for directions to Bucky Doo Square and they will point you to the area in front of the Town Hall. But ask them why it's called such a strange name and, chances are, they will be stumped. A few years ago, we decided to investigate the origins of Bucky Doo. A number of interesting and strange theories came to light. It was claimed that a public house with the name 'Buck and Doe' existed there during the 17th Century but we could find no evidence of this. Another, that a market pen housing goats was located there, with people having to walk through the faeces, or 'Bucks' Doo'. Since then, a few of our investigations and conclusions have popped up on other websites and in publications. The medieval term 'Bocardo' seems to be the most logical explanation. With a Dorset accent applied to it over a period of a few centuries, Bocardo could easily end up as Buckydoo or Bucky Doo. The name of Bocardo Prison in Oxford is considered to have been derived from the term for a syllogism (an argument or to reason), thus an awkward trap from which to escape, bocardo. There was a Bocardo Prison in Oxford from around the 11th Century, until it was demolished in 1771. We knew that a lock-up cell had existed in Bridport Town Hall but this was not built until fifteen years later in 1786. So our quest was to find a medieval connection between Bridport, Oxford and their Bocardo Prison. In 1209, a violent rift occurred between the Town and Gown of Oxford (citizens and scholars). It led to most scholars and tutors leaving the University of Oxford and forming a new institution (university) in Cambridge. Others went to Reading, with a few making their way to Salisbury and beyond to Bridport. The rift occurred due to some scholars being wrongly accused of killing a woman. The mayor of the city sent them to prison and King John subsequently ordered their hanging. When the Pope heard of the disputes, he sent his Papal Legate to punish the town and King John was forced to submit. King John had also been in dispute with the Pope over the appointment of the Archbishop of Canterbury. The citizens of Oxford were ordered to support the university for the benefit of poor scholars and provide them with an annual dinner in December (St Nicholas' Day). Later in 1238, further unrest caused the Papal Legate to be attacked and his brother being killed, resulting in more scholars to abandon Oxford. A scholar imprisoned from this incident was John of Bridport, possibly a relative or fellow townsman of Giles de Bridport who became the Bishop of Sarum (Bishop of Salisbury) from 1256 to 1262. Giles de Bridport was born in Bridport at around the year 1200. He founded a college of scholars at Salisbury in 1260, the College de Vaux, though a university was never established there and also completed the building of the present cathedral. In 1075, Bridport churches had become part of Old Sarum (Salisbury) and are now part of the Diocese of Salisbury. So, during the 13th Century, an outpost of Oxford University had been established at Salisbury, with a smaller one in Bridport. In 1260, St Andrew's Chapel was built (on the current site of Bridport Town Hall), presumably as a friary for the benefit of the Carmelite Friars who came to Bridport at around that time. When Sir John Chideock was refused permission to build a larger priory in 1365, they left Bridport. St Andrew's Chapel was modified to incorporate a dwelling house, school, sessions house and a small lock-up cell for prisoners. Was the school used by the scholars from Oxford? The chapel ultimately fell into ruin and subsequently replaced in 1786 by the current Town Hall. Therefore, we now have our connection between Bridport, Oxford and a medieval prison, Bridport's own Bocardo, or Bucky Doo. But perhaps the final question is, should it be spelled as one word, Buckydoo, or two words, Bucky Doo? As the origins are from Bocardo, it should be Buckydoo, but as we are so used to it being two words, Bucky Doo, perhaps we should let sleeping dogs lie. 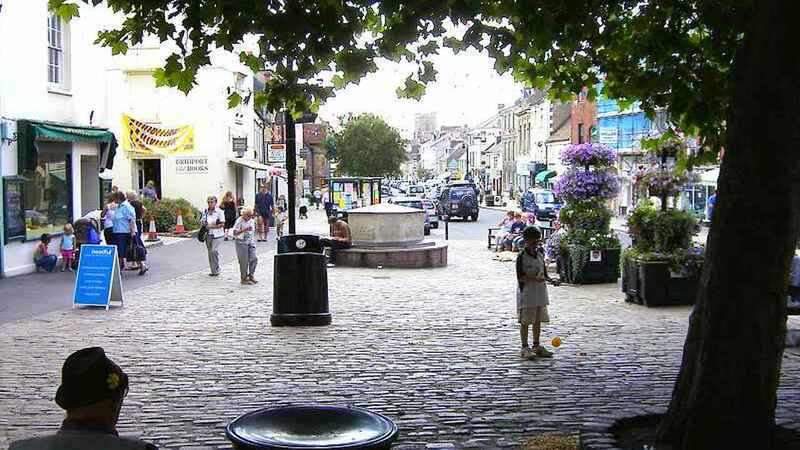 The passage between Bridport Town Hall and the Greyhound Inn has been known as Bucky Doo for many centuries, however the area of Bucky Doo Square was only recognised as such from the mid 1990s. A corn and produce market building had previously been located there since 1788, demolished in 1946 to make way for a taxi rank, then being available as a general public area in the 1990s. Barbara, Baroco, Bocardo, Camenes, Camestres, Celarent, Cesare, Darii, Datisi, Dimaris, Disamis, Ferio, Ferison, Festino and Fresison. Two examples are given below, Bocardo and Barbara. Note the negative aspects of Bocardo.